Wondering when your order will arrive? If you already have a tracking number, head over to www.usps.com to track it! If you don't have a tracking number, enter your email and order number below. 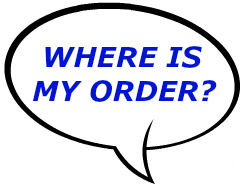 Enter your Email Address and Order Number to retrieve your order status. An email is the fastest way to get your questions answered! Want to speak by phone? Include your phone number in your email, and we'll call you!